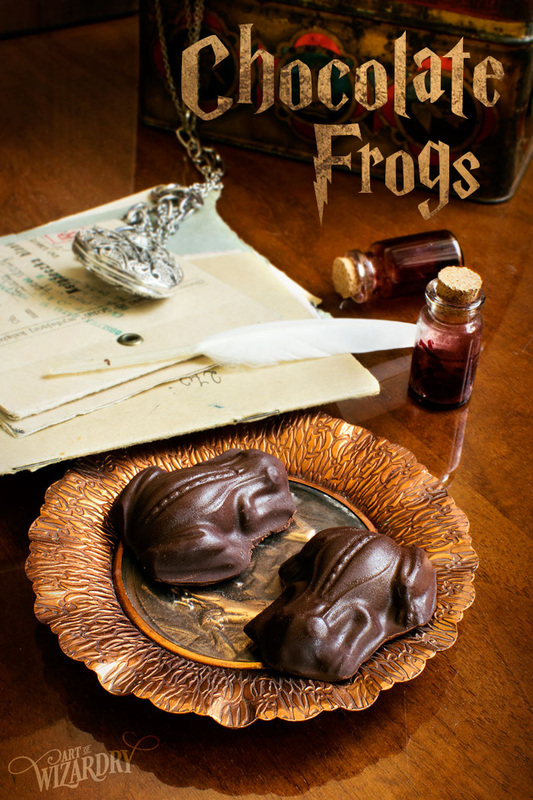 Harry: (picks up a blue and gold package) These aren’t real chocolate frogs, are they? Ron: It’s only a spell. Besides, it’s the cards you want. Each pack’s got a famous witch or wizard. I got about 500 meself. 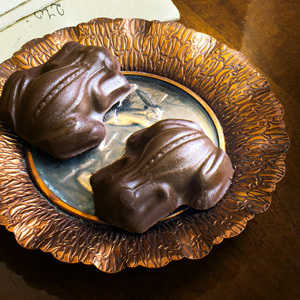 Harry Potter’s Honeydukes Chocolate Frogs come straight from the Hogwarts Express – there’s nothing more magical for a wizard-themed party! Better eat them quick, before they make a run for it and spring out the window! If you ever wondered just how these frogs jump like the real ones, it’s because of one magic ingredient. These frogs contain 70% croakoa, an enchanted substance making their legs springy. It also makes them croak like crazy. Since you can only get croakoa in special stores for advanced mages (wink, wink), normal chocolate will do. I assure you, they will taste just as delicious as the original. 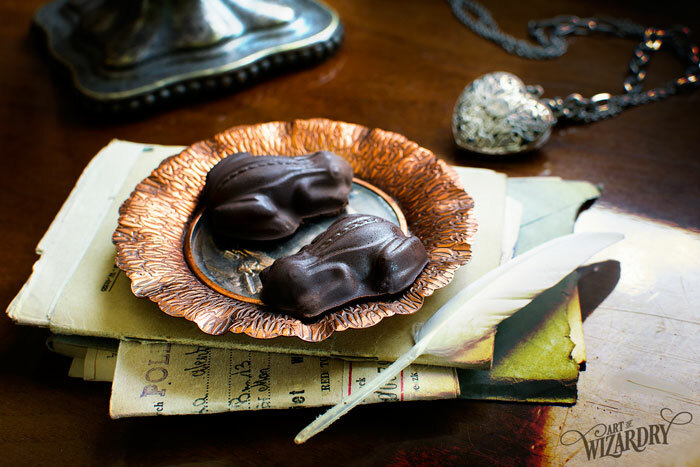 Chocolate frogs mold – how to select one? 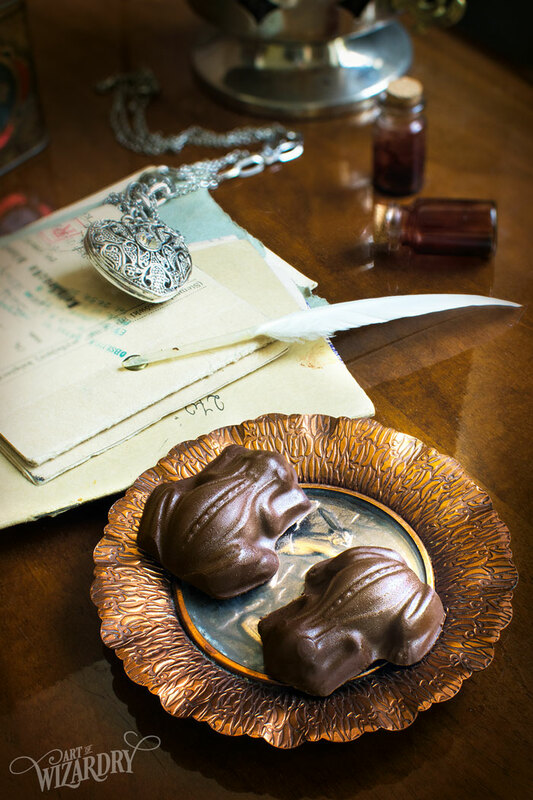 All you need for these enchanted amphibians is a chocolate mold and high quality chocolate that will melt well. The former might be hard to get in regular stores. There are various types of molds available – polycarbonate, metal, plastic and silicone. Unfortunately not all of them are available in the “froggy” design. Personally I favour the silicone molds BUT I couldn’t find one that would look realistic enough. Eventually I purchased a plastic version inexpensively on amazon and it worked perfectly. Place the chocolate chips into a medium bowl. Make sure the dish is microwave safe. Microwave at 70% power for 1 minute, then stir well. Carefull though! The bowl gets hot. Put the chocolate back into the microwave for an additional 15 seconds (again - at 70% power). Stir until chocolate has completely melted. Pour about 1 tablespoon of melted chocolate into each mold. Using a silicone brush, spread the chocolate to cover the whole bottom of the mold. 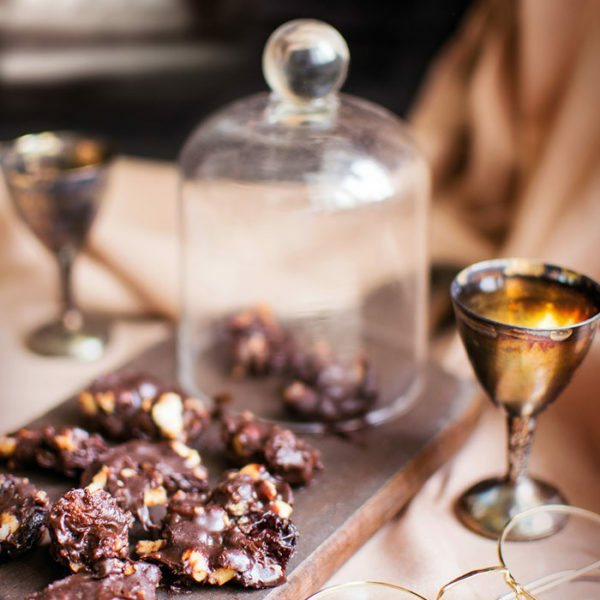 If you need more chocolate - add it. Take the mold out of the freezer. Fill each frog with a large teaspoon of peanut butter. If you would like to stick a nut in the middle - go for it! 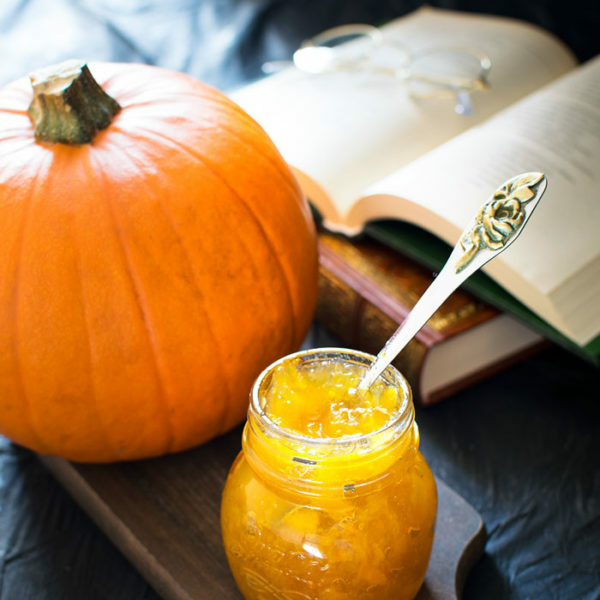 Smooth with a spoon or a knife. Pour the remaining chocolate over the peanut butter and spread it to cover each frog. Freeze again, this time for 30 minutes. Pop out of the mold. Make sure they don’t run away! If you’re making these as a gift, it would be great to pack them up in an original box. 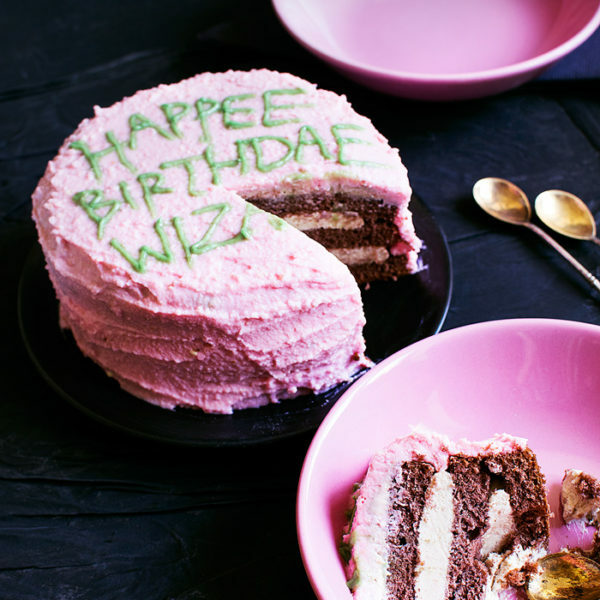 Maybe even include a few chocolate frogs cards? Fear not – we will have the printable templates available soon in the Magic Library.